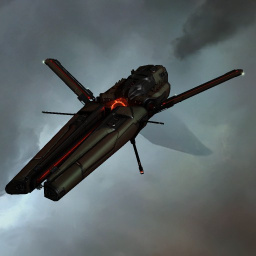 The Drekavac is a Battlecruiser from the Triglavian Collective, introduced with the Onslaught expansion in November 2018. Like all damage-focused Triglavian ships currently available, the ship's stats heavily favor armor tanking, and maintaining range control is very important due to the damage ramping mechanic of the Entropic Disintegrators that the ship is bonused for. The Drekavac's three utility highs makes it more convenient than most other Tech 1 and Navy Battlecruisers for capsuleers to equip one or more Command Bursts. Further information about additional or recommended skills to pilot Drekavac for a specific or it's common role(s) can be written here. This page was last modified on 27 March 2019, at 07:42.